The UST Golden Tigresses are still in contention for a twice-to-beat edge in the Final 4. Arvin Lim, ABS-CBN Sports. 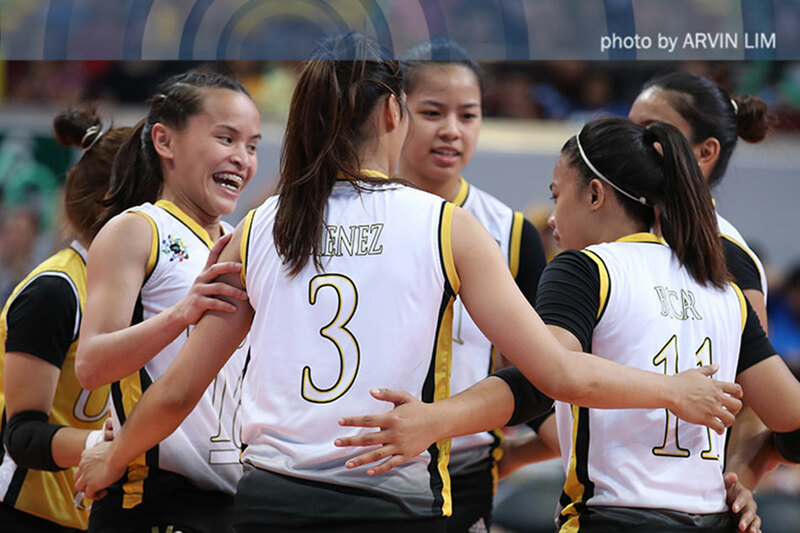 MANILA – Sisi Rondina submitted another fine performance to help University of Santo Tomas stay in contention for a twice-to-beat edge in the UAAP Season 81 women’s volleyball tournament. The Golden Tigresses bolstered their chances of claiming a semis bonus after a 25-23, 25-18, 25-23 triumph over Far Eastern University on Sunday at the Mall of Asia Arena. Both teams are already assured of spots in the Final 4 after University of the Philippines’ loss to National University in the first game of the double-header. UST is making a return trip to the semis after missing out last year; FEU, for its part, is in the Final 4 for the fifth season in a row. UST, with its 9-4 win-loss record, is breathing down the neck of defending champion De La Salle University (9-3) for the second seed. FEU, for its part, dropped to 8-5 and still has an outside chance of securing a twice-to-beat edge, although the Lady Tams are no longer completely in control of their fate when it comes to their semis seeding. “Medyo maganda ‘yung ranking ngayon kasi safe na yata kami sa Final 4,” said UST head coach Kungfu Reyes. “Gusto naming tapusin in high note ang elimination. May mga laro pa rin na naiiwan. Titingnan pa namin kung mababago pa ang standing sa 2, 3, and 4. Basta ise-secure namin yung Final 4 namin,” he added. Rondina was superb, tallying 21 points and getting M-V-P chants from the UST gallery at the MOA Arena. Rookie ace Eya Laure added 17 points, as the Tigresses unloaded 41 kills on the Lady Tamaraws. In a nip-and-tuck first set, it was UST that surged to set point, 24-21, off a fine attack by Laure after FEU gave up a free ball. But the Lady Tamaraws saved two set points, courtesy of veteran Heather Guino-o, prompting Reyes to call a timeout. The Tigresses executed well from the break, with Rondina uncorking an unstoppable down-the-line hit. UST rode the momentum of that opening set win to claim a comfortable victory in Set 2. They were cruising to another triumph in Set 3, 20-16, when their own errors and the sharp serves of Guino-o allowed the Lady Tams to come back. An 8-1 run by FEU pushed them ahead, 22-21, with Guino-o scoring two aces while UST committed several miscues. Fortunately for the Tigresses, Rondina was there to quell FEU’s uprising: she scored from the backrow to knot the count at 22, before Kacey Galdones rejected Jerrili Malabanan and setter Angel Cayuna was called for a net touch. That unforced error put UST at match point, 24-22, but the Lady Tams fended them off thanks to a hit by Celine Domingo. That was FEU’s final stand, however, as Laure scored the winning point for the Tigresses. “Isa lang ang masasabi ko kanina, sobrang focused ‘yung paglaro namin,” said Rondina, who added 15 digs and 12 receptions for a triple-double. Guino-o finished with 14 points for FEU, but no other Lady Tam scored in double-digits. As a team, FEU managed just 28 points, although they got 30 free points from UST’s unforced errors.